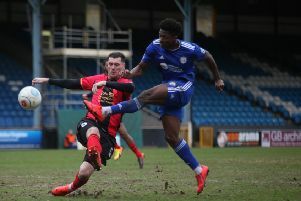 Football - FC Halifax Town v Salford. Halifax Manager Jamie Fullarton. Town boss Jamie Fullarton has called on his side to sharpen up their act in-front of goal, starting at Chesterfield on Saturday. The Shaymen have failed to find the net in four of their last five games, and only Aldershot have scored fewer goals than them in the National League this season. Halifax’s last goal - Matty Kosylo’s equaliser against Solihull in the FA Trophy - was four-and-a-half hours of football ago. “It’s something that needs to improve,” said Fullatron. “If we’re going to have the points total that reflects how the players have been performing, then we need to improve the amount of goals we score in relation to chances created. “That’s not me being a progressive, out-there type of manager. That’s just a fact. “The fans that come and watch us can back that up. That’s where we need to improve. Striker Scott Quigley, who was brought in on loan from Blackpool to address Town’s lack of firepower, is still to find the net after five games. When asked if Saturday would be a great time for him to get off the mark, Fullarton said: “It’d be a great time for any player to get off the mark. It’s not about one individual, it’s about a team. “Defensively, we’re probably as strong as any team in the division, but that’s not just down to the back four and the goalkeeper - who have been excellent. It’s from the front, it’s a team effort. “Any attacking player will tell you that, when you score, it gives them that air of confidence, and it’d be great to see that. Chesterfield are 21st in the National League after a hugely disappointing season, in which they were tipped among the promotion favourites at the outset. They go into the game on the back of a 2-0 home defeat to Conference North side Brackley, but that is their only defeat in their last seven matches. “They rotated a little for the Trophy as there were some players who weren’t eligible, some that couldn’t play,” said Fullarton. “So you can’t read too much into the game. “John Sheridan’s still new at the club, having only had three games. “Obviously you get a reaction from players when there’s a change at a football club, some have a bigger reaction than others. “He’s an experienced manager, he’ll know what he’ll want to do. It looks as if he’s trying to evolve the playing squad, bringing in his own players to play in a certain way, and trying to get some players out. “They’ve been an established league club, with a huge budget, excellent stadium and facilities, and therefore there’s an expectation there, I would imagine, to be better, and their budget suggests they should be better. Halifax had no game last weekend, giving them a chance to recharge their batteries ahead of what could be a pivotal month, with four games against teams below them in the table. Fullarton, who had no new injury concerns going into the weekend, said of the mini break: “You can look at it both ways. When you’re playing as we have been then you want to maintain that momentum. “We’d have liked to have played but it wasn’t to be, so you take the advantage of that, not so much the physical break, but the mental break, to refresh and go again. Fullarton rejected the notion that February - with games against Chesterfield, Aldershot, Maidstone and Havant and Waterlooville - could prove a defining month for his side though. “Every week is different,” Fullarton said. “Every game reduces the amount you have left, as you strive to get as many points as you can. “I don’t see it like that, because we’ve still got March and April to go. “We have 16 games to play, and every one, home and away, is important, that we’re looking to take three points from. “I don’t buy into it being defining. We look at the whole season, in terms of how we categorise it, how we group it, and what we’re looking for. “You could say the Christmas period was defining, when we were playing all the top teams.